Every two kennels has a large sand yard attracted with a shaded area. During the day the dogs have accesses in side and out. 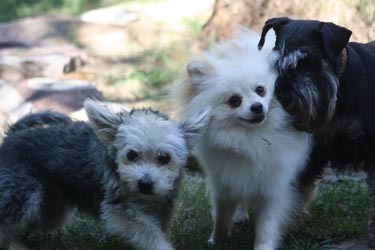 If your dog comes on their own and are social, we try to match them up with a friend during the day. If you have more than one dog they are only separated at feed times. Our kennels have a large platform type bed, which we cover with carpet, and your own bedding. If you don’t bring bedding, we will supply your dog with a blanket. There is a concrete area with of room for them to get up and move around during the night and all water dishes are stainless steel and inside the kennels. So they are clean & cool. If your pet plays with their water, we use a secure stainless steel bucket, slightly raised and attracted to their fence. Water is checked throughout the day. Attached to the kennels is a large grass, fully fenced exercise yard and the length of time depends on the dogs. Some of the oldies have a sniff around, and then want to go back to thier own area. However, working breeds and young dogs do need longer. All the dogs are let out to play in this area twice are day. Before going home, dogs a bathed (with a herbal shampoo) and brushed, nails clipped and ears cleaned if required, (please advise us if you don’t want your pet washed). If your dog has allergies, or you have a shampoo preference, we are happy to use your products. Again we are happy to use your own food if provided. First night, if your pet won’t eat, we don’t get to concerned. However, after that real effort is made to get them eating. It may just be that they are unsure in a new environment, so simply sitting with them, or hand feeding them can do the trick. If not, we will cook for them, and try different things. This is were your information about their likes and dislikes is very important. We do like to give bones where possible. We are also happy for you to bring treats, but be advised they may be shared with friends. The dogs are put to bed with a cuddle and a treat, and our kennels have been designed to be very warm in winter, and cool in summer. They also have lot of ventilation, and if your dog wears a coat a night, please supply it. The Kennels can be a bit intimidating for small and house dogs, so we have a limited number of dogs that can be with us in our home stay. This is pretty much like being at home for them. The littlies like nothing more than to be with us on the lounge having a cuddle, and small walks are provide from the home stay. If you’re pet is unhappy with the accommodation you have chosen, we try different areas, and if we need to, upgrade them. This is done at your expense. Any minor heath problem that may come up are treated by us. If your pet requires vetinary treatment, we prefer to use your vet were ever possible. However, we do charge for travel and time. But will be with you pet every step of the way if they need us to be. We are capable and comfortable with dealing & medicating diabetic dogs, and giving out medications that you supply for you pet. We understand how upset you can feel about leaving you family member, so we try to make the booking in process as quick and stress free as possible. So we ask that you have every thing ready, including your vaccination certificate that you dog is flea free, and has been covered for both flea and ticks. It’s a great idea to provide us with what we call "your pets users manual". You know your pet best, so any information about likes and dislikes, any medication, a list of things that you have supplied, (such as extra bedding), any contact numbers whilst you are away ect. This may help us give them a more enjoyable time at the kennels. It also puts less pressure on you to remember everything. It is important that your dog is on a lead, and that you wait in your car if we are with a customer. Try to see this from your pets point of view, the quicker we can start to bond with them the better. When you leave we will spend time cuddling and reassuring them. 15 acres close to the daisy hill state forest, means that this a beautiful property, with a balance of open and bush areas, automated gate for your convence (so you can be directed to which part of the property you need to) and reception Kennels. There are also large brick, propose built kennels, constructed to our specifications, to give the dogs lots of room. The kennels have an external door that goes straight into their sand yard. The kennel floors are sealed concrete, and have a gradual slope so that there can be no puddles. 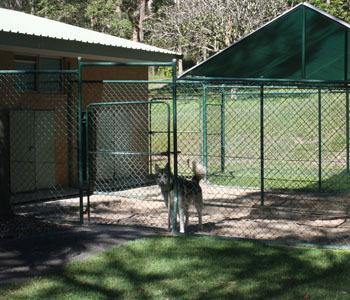 The kennels are built in such a way that in summer, they get all the cool breezes, it is a very pleasant environment. All fences at the Kennels 6 foot high, and made of chain wire colour bond, or weld mesh. We have an escapee proof area where, not only the internal kennel, but the yard attrached is also fully enclosed. This can be booked in advanced. Large sand yards with a shade cloth roof area, access from inside and out during the day, coupled with a big grass play paddock and 6ft fence. We have embraced your best friend into our own home. Lots of cuddles and room to move.